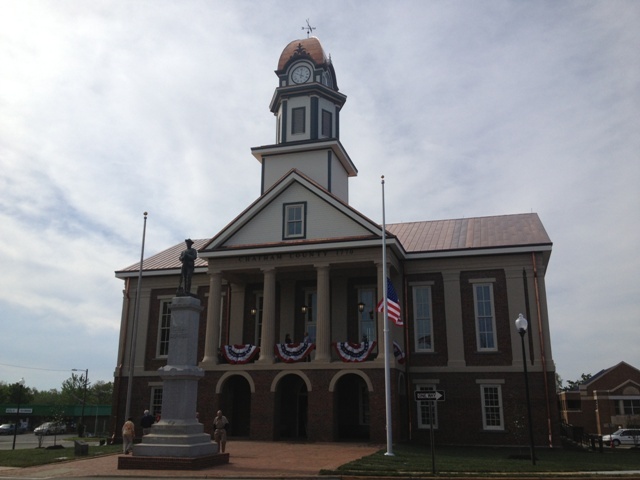 The Chatham County Courthouse reopened this year, with much fanfare and new features alongside preservation of the structure. A larger space for the Courthouse Museum tells the story of Chatham County through pictures, displays, and interactive exhibits. We were fortunate to have a conversation with photographer, Matthew Ford, who took some incredible photographs throughout the rebuilding process, with the help of a pinhole camera he constructed. Matthew Ford has previously worked as a lighting technician in the motion picture industry in New York City and since a young age has been moved by the power of imagery and photography. In 2001, he started architecture school at the University of Washington in Seattle, where he took architectural photography classes and also earned his Master of Architecture degree. Today, he lives north of Pittsboro with his wife and son. Matthew is a licensed and registered architect, in both North Carolina and New York, working professionally as an architect with JSA-Jim Spencer Architects, in Carrboro, NC. 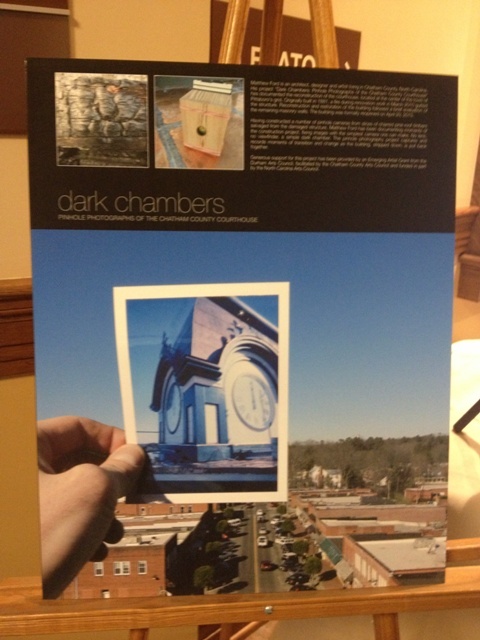 How did you learn of the Courthouse project and what gave you the idea to photograph with the special camera? Did you make the camera and do you still have it? Although I have experimented with a camera obscura (making a camera from our small Seattle house’s front bedroom as a conceptual study during architecture school), I came upon the idea of making a pinhole camera sometime during the process while the building’s remnant’s future was being decided. The fact that the structure was roofless and open to the sky helped…I made two simple pinhole cameras for this project. They are essentially pine boxes, constructed from wood sliced down from the charred, damaged, salvaged roof timbers of the building. Both cameras are sized to shoot on 4″ x 5″ sheet film, with an instant film back, or with 4″ x 5″ sheet film holders. I still have the cameras. The cameras are a central part of the project and are integral to understanding the work. When I had the chance to exhibit prints in the courthouse at it’s formal reopening on April 20, 2013, I displayed the cameras for many visitors. Much of photography and image making these days is so related to the overwhelming prevalence of digital imagery that seeing an actual film camera, let alone a lens-less pinhole camera, is, I’m afraid, a novelty. I photographed with the cameras that day as well, in and among the crowds of people visiting. This is the most ambitious photographic project I have undertaken to date. I have not to this point exhibited photographs that so many people have seen, either. This project, in no small part, was an effort to create a document of a construction process that many people don’t get to see, in a unique and artful manner. Photographs are in a way just relics, traces on paper of things that have happened. It’s the event or thing that makes the photograph possible, not the camera. How did you connect with David Hughes, Public Works Director, and what was your conversation to ask him to agree to this ‘secret’ project? I had the opportunity to meet David Hughes as I pursued making this project happen. I explained what I had in mind after having developed the thought of the idea, and being in the right place, at the right time helps and can make things happen. What do you hope people see and what do you see in the pictures you took—what spoke to you about this project? I hope that in these photographs, people see moments in time that they know and understand they would not see otherwise. A photograph is a record of a moment, and this building, dramatically, was rent open and then put back together. I hope this gives pause to the viewer to think about how an image is made, that it takes time, materials, access–many pieces to come together… in the end, an image happens by the exposure of film to reflected light. These photographs are physical remnants of the light that struck the film plane when it was exposed. In part, I tell myself that I would like these photographs to make people think about what goes into building and construction. People’s conception of this building were many, often highly personal and often very public. The structure stood, and stands, for many things to many people. A civic place, a physical marker of the center of a town–a judgmental place. This building burned, and a community (or its leaders) chose to rebuild it, in its entirety. Why do we, as a people, as a town, as a society build things? Why do we have a desire to rebuild that which is destroyed? Buildings have lives, they are born, they are used (they live) and they (sometimes) die. For whatever reason or reasons, and some are understood and spoken, and some (many or most) are not, I think, this community decided, at this moment in time, to not allow this building to die. I hope these images might offer some insight into the why and how of this, beyond just what they superficially and most graphically portray. 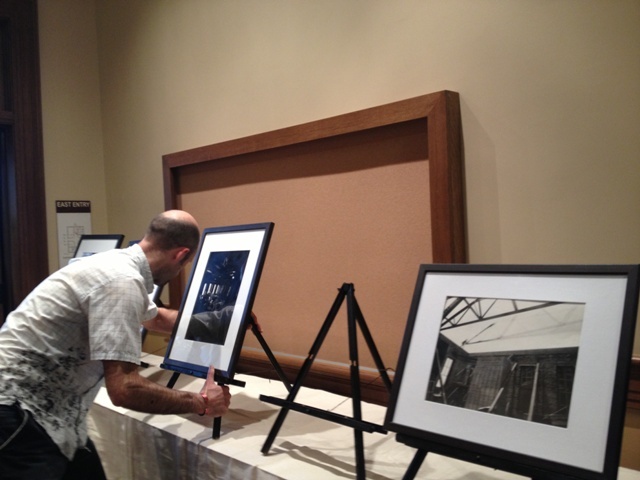 See a sampling of Matthew Ford’s work on display at the Chatham County Community Library for the rest of the month of October as part of their display of County and State Fair Ribbon Winners in the front lobby.